MidsummerSail - The longest & toughest Baltic regatta! ...and get your Finisher medal! THE LONGEST & TOUGHEST BALTIC REGATTA! 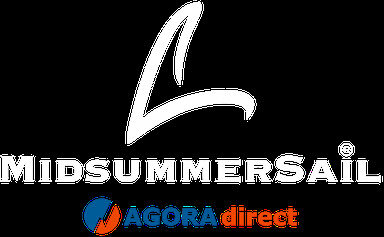 The AGORA direct MidsummerSail is a sailing regatta from the southernmost to the northernmost point of the Baltic Sea. The Baltic Sea is one of the most beautiful sailing areas in the world. There are hardly any tides and during the summer there is almost constant daylight. The Baltic offers all kinds of conditions, from very light to very strong winds, and from all possible directions. A glance at a map will make you want to sail the whole way across. The North-South stretch of almost 900 nautical miles provides the perfect balance between a holiday trip and a sea-going race. The start time 2019 will be June 21 at 1pm, which is midsummer. The time limit for the race is July 5, 2019 at 1pm. The start is in the bay of Wismar. It's the most southern point of the Baltic Sea. The finish is at Töre next to a yellow buoy, the most northern point of the Baltic Sea. 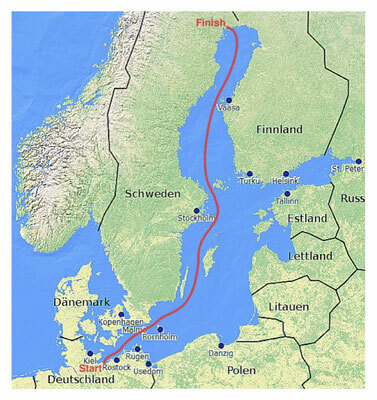 The route is about 900 nautical miles (1670 km) long. 6. Every skipper must adhere to the International Collision Regulations (IRPCS).